I love studies on mummies for the intimate details they give into people’s lives thousands of years ago – from the healing tattoos sported by ancient Peruvians, to the Tyrolean Iceman’s last meal (venison) to the fact that ancient Egyptian high priestess Maatkere was buried with her pet baboon. Although I find them fascinating, such findings admittedly don’t have much wider relevance for our lives today. But there’s a paper on mummies published in The Lancet this week (I’ve also written about it for Nature news) that does have implications for modern life. 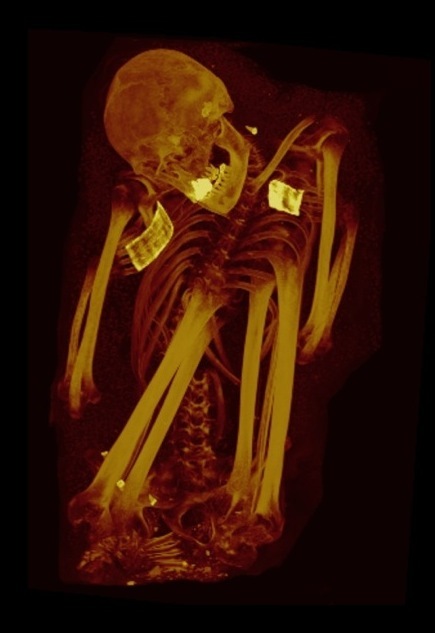 Gregory Thomas of the University of California, Irvine, and his colleagues have CT scanned 137 ancient mummies and found signs of atherosclerosis (where arteries become clogged with cholesterol) in 47 (34%) of them. That was a big surprise. Atherosclerosis, a major cause of heart disease, is generally seen as a symptom of modern life. Sitting on the couch eating junk food causes high levels of “bad” cholesterol in our blood, which then accumulates on our artery walls. Health regimes such as The Paleo Diet are based on the idea that if we can instead eat like our hunter-gatherer ancestors, with a lean diet of proteins and unsaturated fats, we can avoid heart disease. The results of the Lancet study call that into question. Thomas and his colleagues looked at several different ancient populations, including the Ancestral Puebloans (native Americans who lived in the southwest United States) and the Unangan of the Aleutian islands. These individuals would have been physically active and eaten exemplary diets. For example the Ancestral Puebloans were forager-farmers and the Unangans were hunter-gatherers, who fished the icy waters of what’s now Alaska in sea kayaks lined with sea lion hides. Possibilities include genetic mutations and nutritional deficiencies. Thomas thinks it has a lot to do with inflammation – perhaps caused by smoke inhalation (both the Puebloans and the Unangan lived in partly underground houses where the only entrance doubled up as a chimney) or chronic infection. Whatever is going on, he argues that we should think of cardiovascular disease as a natural part of human ageing, and that sufferers shouldn’t be made to feel guilty about not having lived healthily enough: “You didn’t cause this,” he says. All that from some centuries-old dried-up human remains. Paleo diets are NOT usually lean – the one you cite describes the fat content as “moderate to higher amounts of fat.” They’re typically high in both fiber and fat, but low in starches and sugars. This is super interesting, thanks for posting. Thanks for setting me straight on the paleo diet. I agree that the Unangan results are most surprising, as they didn’t have agriculture. Probably worth noting that only five of the mummies in the study were Unangan, but three of them seem to have had atherosclerosis. There’s a discussion in the paper of exactly what the diet of each group would have looked like. Or any aristocratic society where manual labor is left to the bottom 90%. Mummies don’t come from the working class. The Egyptian mummies in this study were artificially embalmed and probably of relatively high status. But for the other groups (ancient Peruvians, native Americans and Unangan), the bodies were naturally preserved by cold or dry conditions. They would have been doing plenty of manual labour – as I say in the piece, the Ancestral Puebloans were forager-farmers, for example, and the Unangan were hunter gatherers.